Salvia forskaohlei (Forskahl's Sage) (Indigo Woodland Sage) The large, almost triangular leaves of this Balkan native make a striking base for the long spires of white-streaked, violet-blue blooms. Robust flower stems arch gracefully above the basal foliage, which lies close to the ground. Accent the beautiful foliage and position mid-border in well-drained soils with fine textured perennials and ornamental grasses. A rather awkward name for such a lovely species. The spelling is often reported differently such as Salvia forskahlei, Salvia forsskaolii and Salvia forskaohlei. Salvia is the largest genus of plants in the mint family, Lamiaceae, with approximately 700-900 species of shrubs, herbaceous perennials, and annuals. It is one of several genera commonly referred to as sage. When used without modifiers, sage generally refers to Salvia officinalis (common sage); however, it is used with modifiers to refer to any member of the genus. The ornamental species are commonly referred to by their genus name Salvia. They can vary widely in height, width, shape and flower colour. Red is the classic bloom colour for salvia in bedding, but gardeners can choose from blue, purple, white and pink varieties as well. 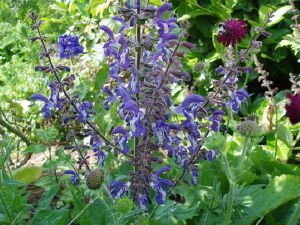 Some salvia varieties aren't hardy in colder northern climates, so are treated as annuals. Requiring little water or attention, this vigorous species really only asks only for a well drained site in a sunny position.